The new one just set a new Hockenheim short record. @ Fangio Man: No surprise there. i love this car because its a street legal racing car. Look at what lotus have been doing! http://www.autocar.co.uk/News/NewsArticle/AllCars/251835/ This car is designed to give rich guy\'s the F1 experience. Your\'s for 650 thousand pounds. 0-60 in 3.8 sec or 4.2 sec..........who cares! People who bang on about the validity of the 0-60 stat with cars like this are missing the point and don\'t have a clue, they obviously haven\'t driven one. 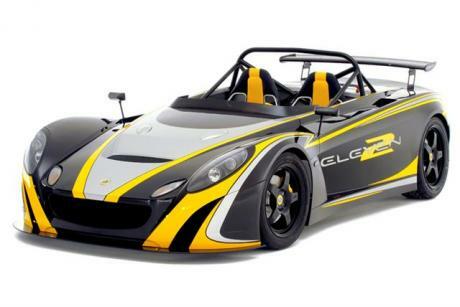 The 2-eleven is one of the most exciting cars on sale, they\'re brilliant. could this run the ring in under 8mins? It might have a long first gear ratio for better acceleration when it most matters on track. Cheers I'll book a test but will probably use a dealer out of the city as there not much fun to be had sat in traffic. I traded in a 987 Boxster S last September for a Ford Focus ST which is now mildly tuned with a remap to 271bhp and 330ftlb.... that is being replaced by a new M3 Covertible in September. 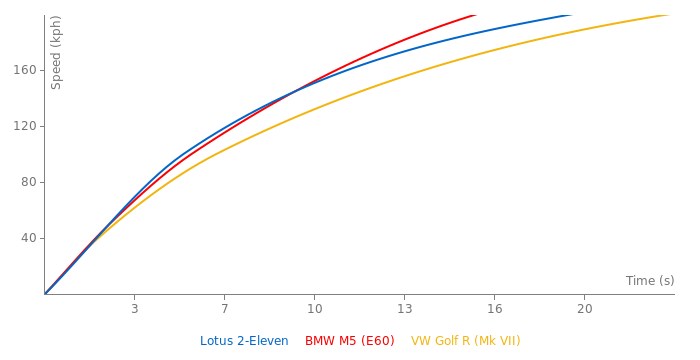 btw.. autocarUK reached nearly the same result 0-160km/h(160mph) as sportauto.. in the 2007 0-100-0mph contest the 2-Eleven reached 11.04s (I add this time) only 0.26s quicker as sportauto but still a 2.14s slower as the 8.9s Lotus claim. nothing they meansured fit with factory claim! The empty 2-Eleven with filled up tank was scaled by sportauto with 776kg (1707lbs.) not 670kg (1470lbs) the weight balance is not 38/62% like Lotus claims it is in real 34.9/65.1% ..sportauto never got the car somewere near the factory claimed 4.0 0-100km/h not to talk about the compeltely unrealistic 0-160km/h 8.9s claim.. sportauto reached 11.3s over a second slower. The car sportauto tested was a UK registered 2-Eleven with the licens plate AUO7 GFY. Please add page number and issue date to magazine name when you next time add alp times from EVO. "EVO" is not a proper reference. "EVO, October 2007, page 12" is. "May friend did it" is not a reference. You have to provide us with some kind of decent proof that he really did it. Perhaps your friend is journalist from some car magazine and they have an article where they mention this lap time. Really looking forward to fetch any lap times for this car. It's a really cool track day car, however, it's also quite pricey.